Work for All Kind of Videos: Recorded Videos in Camera Roll, Movies, TV Shows, Podcasts, etc. Bonus: A Gift for You! TunesMate is a device manager that gives you incredible freedom to transfer files from/to your iOS devices. You can easily transfer large videos from iPhone to PC/Mac. 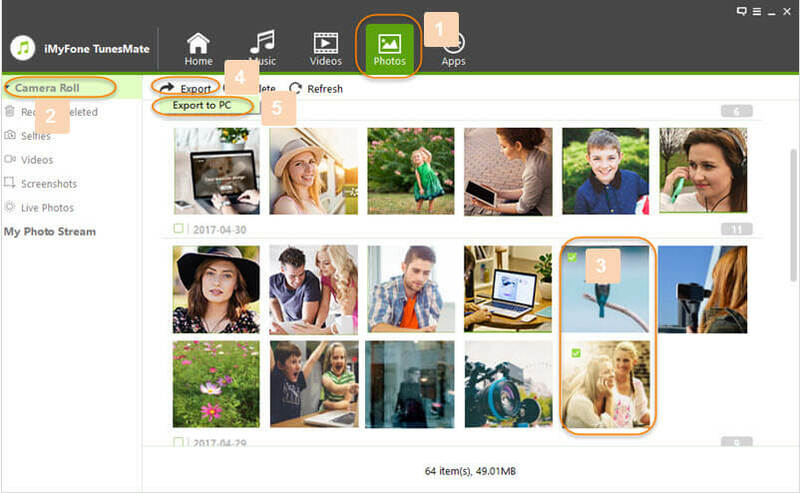 Transfer almost all kinds of videos files from iPhone to computer or external hard drive. 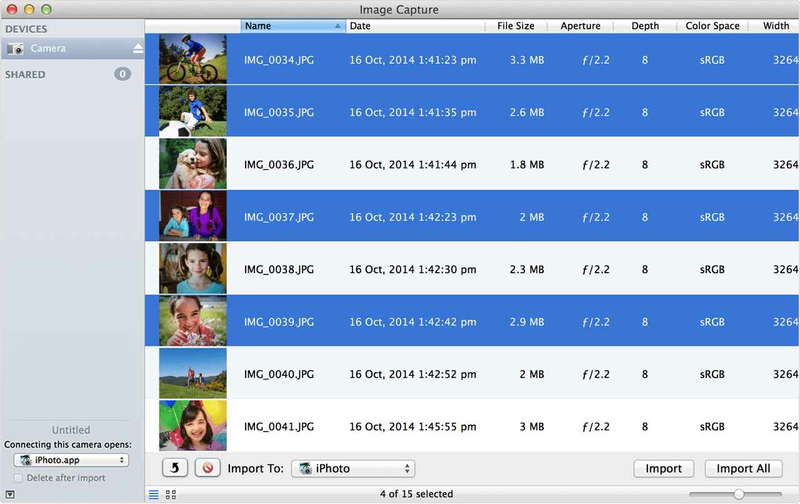 Sync media to iPhone without overwriting the data that’s already there. Add media to your iTunes library from unlimited iOS devices, even in different Apple IDs. Support to transfer purchases and non-purchases freely. An iTunes alternative that does more than iTunes can do. -- by tricksworldzz.com, geekreply.com, etc. Step 1. Download and install TunesMate, then connect your iPhone to your computer. Launch TunesMate and click on the Video tab near the top of the main screen. Step 2. You should see the videos on your iPhone listed in the main part of the screen. Select which videos you want to transfer. Click Export, then Export to PC/Mac. Step 3. 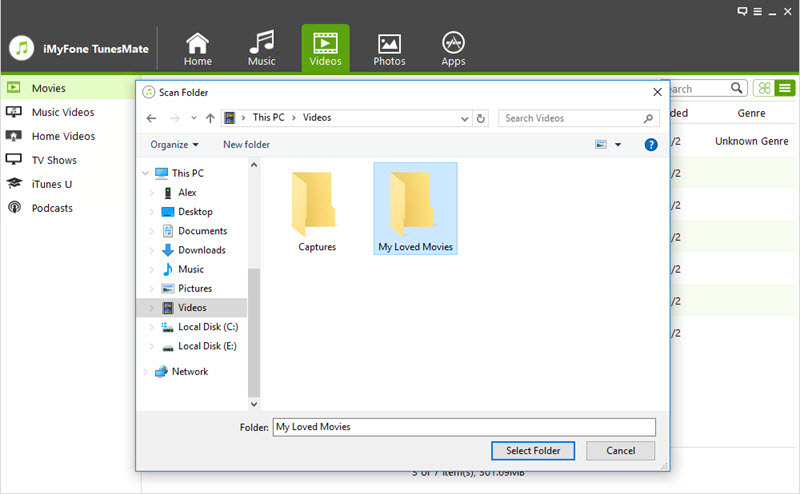 Browse for where you want to transfer the video files then click Select Folder. Now your videos should transfer automatically. Step 1. As before, Launch TunesMate on your computer and click where it says Photos at the top. Step 2. On the left sidebar, to to Videos category under Camera Roll. Step 3. You should now see your camera roll videos listed on the main screen. Select the ones you want, then click Export, then Export to PC/Mac. As mentioned above, now you can browse for where you want to transfer the video file on your computer. Click Select Folder, and TunesMate will begin the transfer. To make it easier for you to run iMyFone TunesMate, we'd like to give all our prospective and loyal clients a 20% discount coupon code. This code works on every iMyFone TunesMate package, and on every serial key. Learn how to use coupon code for purchasing TunesMate license here. Step 1. Copy the code above and go to iMyFone TunesMate Purchase Page. Step 2. Select the license you want to buy and click the blue ‘Add to Cart’ button to proceed. Doing this will take you to the shopping cart. Step 4. Now paste the code 5ED-FQ1-KZU in the textbox shown on the page and click “Apply”. Step 5. Now you will find the price was reduced 20%. Then just fill in your purchase info to finish it. Click where it says Share Camera near the bottom of the window and turn this function on. You will see your device listed on the left. Click on it. Now you will see your videos and images listed on the main screen. Scroll through them and select the ones that you want to transfer to your Mac/PC. Now click Import. 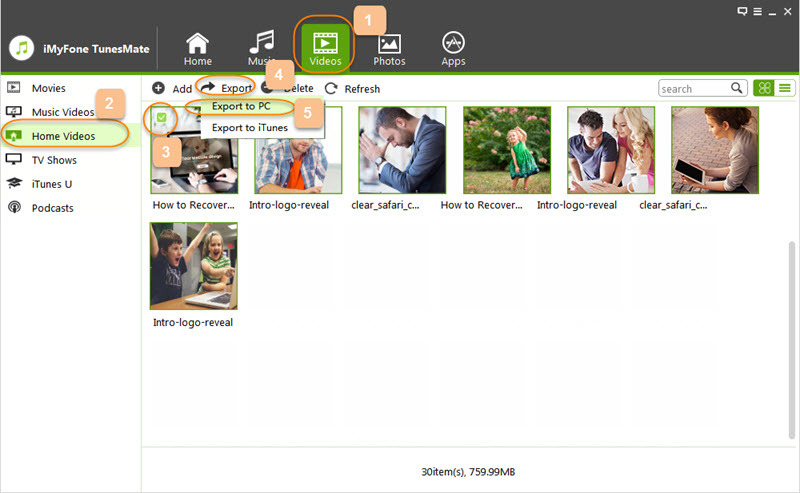 If you want to import all of your videos and photos, you can also just click Import All. The biggest one is that it only works for videos on your camera roll. Basically, you have to have taken the video yourself to be able to transfer it. You can’t transfer movies or TV shows. Also, if the file is too big, Image Capture can freeze during the transfer. It can only work for Mac computer.